Who makes it into the top 10 pound-for-pound boxers of 2016? Much disputed, debated and demeaned too, boxing’s pound-for-pound list remains the definitive way to single out the best boxers in the world. Making the selection for 2016 requires serious deliberation, as changes must be made. 2016 is only the second year in approximately 11 years of boxing that Floyd Mayweather is not at the top of boxing’s pound-for-pound list. Mayweather cannot be included on the list simply because he seems to be fully retired – for now, just like during a period between 2007-2009. Whether “Money” decides to sit on his 49-0 record forever and not try for the fabled 50-0 which would break Rocky Marciano’s undefeated reign is something we will likely find out in 2017. Miguel Cotto, on this list last year due to his middleweight title run before it was ended by Saul Alvarez, and 2015’s two best heavyweights – Tyson Fury and Wladimir Klitschko – did not fight in 2016 either, so none of them can make the list. This leaves at minimum three places that need to be filled on last year’s pound-for-pound list which you can see here – https://jazztheory.wordpress.com/2015/08/03/the-10-best-pound-for-pound-boxers-in-the-world-today. So who makes it into the top 10 pound-for-pound boxers of 2016? With now eleven defences of the WBC bantamweight title to his name, there is no denying Japan’s Shinsuke Yamanaka a spot in boxing’s pound-for-pound list. In 2016 Yamanaka had his toughest two fights of his career and won them both well. First he comprehensively out-pointed Liborio Solis, the seasoned former world champion who proved himself world title level when he lost a decision to Jamie McDonnell just eight months after losing to Yamanaka. Then he faced Mexican former world champion Moreno, who took him to a split-decision in 2015 and won via knockout in seven rounds. At 5ft 7in, Yamanaka is a giant at the weight and literally stands out among the current bantamweight champions as the standout boxer. He is a fast, aggressive, powerful southpaw with a tough style to deal with. However, the boxing world will be hoping he goes for a unification bout in 2017, which is when we will really find out his credentials. The second name to make his debut in the pound-for-pound list, Carl Frampton is arguably 2016’s boxer of the year, and thus leaping into the top 10. Firstly in February, Frampton won a close but clear decision win against British rival and WBA super-bantamweight champion Scott Quigg. With that win Frampton unified the WBA with his IBF title (although Guillermo Rigondeaux would disagree with that as the super WBA champion). Following that win, Frampton moved to featherweight to take on undefeated WBA champion Leo Santa Cruz. Frampton won a majority-decision in a fantastic fight. The Irishman is a really well-schooled boxer, able to implement different strategies to handle different styles. Frampton can do this because he is a very intelligent boxer, whilst he also possesses real power and immense toughness. He finds holes in his opponents games and digs at them. With another year of big fights lined-up for him, Frampton could become a regular in the pound-for-pound list. The more time that passes with “Canelo”, the more boxing fans realise he is not just a world champion, but a true elite fighter. A slick, powerful combination puncher, Alvarez is fantastic to watch. Thus far only Floyd Mayweather has shown the capability of getting within his range without being touched by the southpaw’s thunderous hands. Top opposition such as Cuban Erislandy Lara and Austin Trout have been unable to out-box Alvarez, although the Lara fight was very close. In the last 13 months Alvarez has beaten the legendary Miguel Cotto to win a middleweight world title, knocked Amir Khan clean out with one punch, and forced a referees’ stoppage against WBO light-middleweight champion Liam Smith. Unfortunately for Alvarez, all anyone wants to see is him against Gennady Golovkin, the monstrous middleweight champion. His promoter Oscar De La Hoya has said on recorded video that he promises that fight happens in 2017. If this is true, by the end of 2017 Alvarez’s place on this list could alter dramatically this time next year. Nevertheless, the lack of hype around the Cuban should not disguise the fact that this may be one of the most talented boxers ever, something Freddie Roach himself stated. Amazingly quick and agile, Rigondeaux is brilliantly elusive, whilst he also possesses a sniper of a left-hand. However, the lack of hype has affected him in as much it has given a reason for other champions to avoid him. A two time Olympic gold medal winner and a two time world amateur champion, Rigondeaux took to the pro game like a duck to water, winning a world title in just his 7th bout in 2010. However, the big fights have been few and far in between for Rigondeaux. It is close to three years since his last meaningful fight. In 2015 he kept ticking over with comfortable wins against highly spirited – if not highly rated – contenders. Other champions like Frampton, Santa Cruz and Quigg have all moved up without fighting Rigondeaux. Although he is currently calling out Vasyl Lomachenko for a fight, at 36, with allegedly over 400 amateur fights behind him, we may never get to find out how good Rigondeaux really is. However, right now Rigondeaux is still one of the very best boxers on the planet and someone that could be at number one on this list if he gets the right fights. The fact that someone as good as Terence Crawford is not in 2016’s top five shows just how good the current crop of boxers are. An undefeated two weight champion, Crawford is America’s next great boxer and is proving it in every fight. 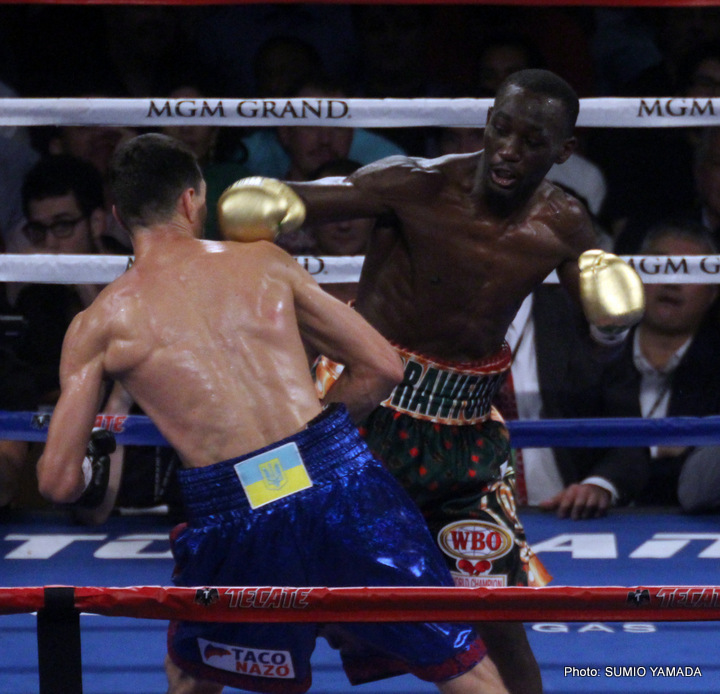 In between knockout out two perennial contenders in 2016, Crawford faced the undefeated WBO champion, Ukrainian Viktor Postol. In an outstanding display, Crawford completely outclassed him and cemented himself as light-welterweight’s elite champion. Now Crawford has some big decisions to make about when to move up to welterweight where the biggest fights are. Whatever decision he takes, the rangy and powerful Crawford will be a match for anyone. Crawford is both a great boxer and a great fighter, knowing how to utilise his long reach and really punishing opposition with a variety of shots. Currently, there is no one in his division that would be given any real chance at beating him, and that is why Crawford cannot be denied a spot in boxing’s pound-for-pound list. “GGG” is already one of history’s most fearsome champions. He is a man that goes about destroying boxers with a calm confidence which terrifies many. In 2016 Golovkin beat two undefeated boxers. First he destroyed Dominic Wade and then forced a stoppage against Kell Brook. Neither are world-class middleweights, meaning the Kazakhstani still hasn’t got a A-class middleweight to his name yet. As such, there is still something to be proven by GGG, which he can do when he takes on WBA middleweight champion Daniel Jacobs in March 2017. Nevertheless, Golovkin has proven he is pound-for-pound quality through the manner of his victories. He is going through world title challenges like sparring sessions, man against boy. Some of his knockouts have been frightening and he is doing it with every type of punch; lead left-hook, straight right, body punches. Tough fighters are folding up in the face of his onslaughts. While the Jacobs fight seems a mere formality, he still needs to get it done. However, the real fight for him is either against Saul Alvarez or a super-middleweight champion. With his unavoidable stalking style, how any of the aforementioned will handle his power will determine just how high up this list the Kazakhstani will go. In just eight fights Lomchenko has made it to the top four of boxing’s pound-for-pound list. And the Ukrainian is so good, even his loss contributed to this remarkable rise. In just his second fight, the two time Olympic gold and two time World Amateur Champion gold medallist was given a shot against world champion featherweight veteran, Orlando Salido. The Mexican grinded out a points victory, clinging on for life in a dramatic 12th round. That single fight seems to have taught Lomachenko everything he has needed to know about the professional game, and he has since looked flawless. Since then he has won all his fights including beating certified world class talent like Gary Russell Jr and Roman Martinez, and he has done it using a style that is all of his own. Lomachenko uses angles and footwork in a way that has to be seen to be understood. He is constantly dropping his hands, bobbing, weaving, sidestepping and playing the matador to the bull, whilst often on the front-foot too. On the inside, Lomachenko is sheer murder. He finds punches on the way out of a tie-up/clinch that opponents never see coming, and he does this so often seasoned world champions like Nicholas Walters quit on him (during their fight last month which saw Lomachenko become a two-weight champion). The only issue for Lomachenko is that his promotional team may look to rush him up the weight divisions. Should Lomachenko let him build his reign slowly, he really could be an all-time great. In a legacy sealing fight in November, Kovalev came away second best in the eyes of the judges but best in the eyes of many others. Depending on how you saw that fight against Andre Ward, the position of Kovalev could be interchangeable with the others around him here. Some feel Kovalev is basic and was/will again be out-boxed by Ward. Others feel he has a physicality that others simply can’t handle. Whichever way you think, Kovalev is no worse than the third best boxer in the world today. “Krusher” has the kind of punches that breaks through guards and can concuss with even glancing blows. Although he can be somewhat robotic, his tactics are a damn site effective. What is makes him really scary is that he seems to enjoy destroying people. There is not anyone other than Ward that anyone would favour to beat Kovalev that he could realistically fight. Any of the super-middleweights would be huge underdogs against him, whilst the odds for a rematch against Ward would also likely be evens at worst. As Ward showed, it takes a lot of character and strength – mentally and physically – to even come close to beating the Russian. How many are capable of this? Not many, if any, and that is why he must be considered one of boxing’s best three boxers in the world today. Granted, having spent much of his career fighting in the minimum and light-flyweight divisions the opposition for Gonzalez has been limited. But being a four weight world champion at 29 years old with an approximately 80% knockout ratio cannot be denied. This is why Roman Gonzalez is the second best boxer in the world today. The only reason he is not at number one, is because after a long career fighting with a hard style to maintain, “Choclatito” is arguably showing signs of aging. Gonzalez has been near flawless for most of his career and has not had it easy either, going away to Mexico and Japan to fight the best little-men of the world to take his titles. The Nicaraguan is a smooth power puncher that can finish a fight as soon as he hurts an opponent. In the last 12 months though, Gonzalez did not turn out any of his better performances. Firstly, he mundanely won a decision against 16-2 McWilliams Arroyo. The biggest of his two fights was a hard-fought win at his highest weight – super-flyweight – against Carlos Cuadras, providing the Mexican with his first defeat, although at times Gonzalez looked like he could end up on the losing side. Gonzalez is likely to have some really tough fights coming up, considering he is unlikely to move up a fifth weight division and his next opponent will likely be a rematch against Cuadras or Juan Estrada, another Mexican champion that cause him problems. If he can show better form than he did in 2017, Gonzalez will remain one of the best two boxers of the world. Andre Ward had as many fights in 2016 as he had done in the previous three years, and with this cemented himself as the world’s best boxer. Firstly, his early year win against Sullivan Barrera looks better as Barrera continues to work his way towards a world title. Then after a routine win against Alexander Brand, Ward survived a torrid start to out-box Sergey Kovalev, in a real clash of elite champions. Along with all the craft and intelligence we knew he possessed, Ward showed amazing courage, determination and stamina too, in coming back from a second round knockdown and taking the fight to the Russian. Ward’s is this great because he can both effectively exploit an opponent’s weaknesses and neutralise their weapons. A real technician, Ward has a great inside-game, enough speed and accuracy to fight on the outside, great footwork and amazing reflexes. An old-school fighter, “Son of God” has not lost a fight since he was 12. The only fight on the radar for Ward right now is a rematch against Kovalev. In a rematch, it can be assumed a boxer whose game is largely based on reading opponents will come off the better. As such, not only is Ward the best boxer in the world today, he is also likely to remain so. You are here: Home / Boxing News / Who makes it into the top 10 pound-for-pound boxers of 2016?